Comments: The Dr. Reuben Lindsay House at 521 Harrison Street was built between 1800 and 1850. The architectural style of this single-story brick house is Greek revival, and it has a full English basement. Dr. Lindsay (1827-1881) lived in this home and was so highly regarded by townspeople that Lindsay Street near his home was named after him. 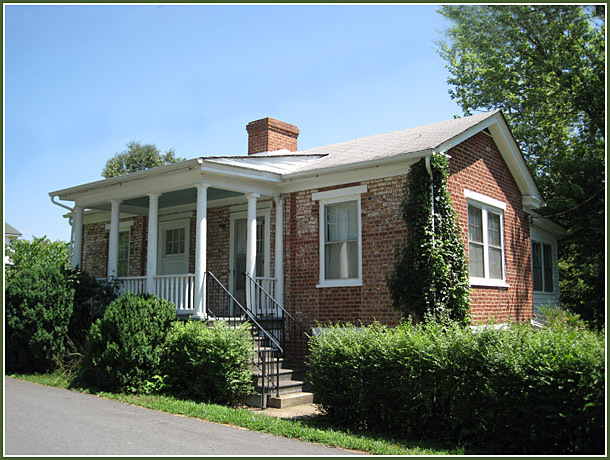 The house was later owned by Captain John Pitts, who conveyed it to the Reverend James E. Daniel, the Scottsville Methodist minister from 1920-1925. Dr. Reuben Lindsay was a much beloved Scottsville physician and an active Mason in the local Lodge. Upon his death on October 27, 1881, the headlines of the town newspaper read, "A Public Calamity, An Entire Community in Mourning! Imposing Masonic Funeral." The Presbyterian Church on Bird Street was packed with friends saying goodbye, and the Masonic rite for Dr. Lindsay was presided over by the Most Worshipful Grand Master of all Virginia, Peyton S. Coles of Estouteville. Some 1000 mourners, double Scottsville's population, followed the hearse to the Presbyterian Cemetery (now named Scottsville Cemetery on Hardware St.). The doctor's carriage horse, led behind the coffin, was dressed in black. The doctor's faithful servant, Uncle Ned Jefferson, held the bridle, "The poors have lost their best friend!"